Mighty Thor remains one of the most renowned of all the Norse gods. A powerful and brooding figure, it is said that using his hammer, Thor could carve valleys out of mountains and that his enemies would quake in terror at the thunderous sound the weapon created. Son of Odin, the ruler of Asgard, Thor was avidly worshipped by Viking warriors as the defender of mankind and gods alike. 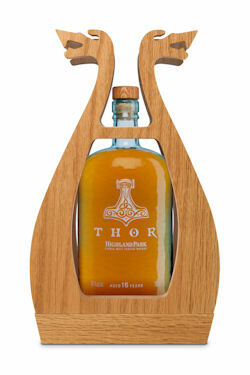 In honour of this great warrior and in celebration of its own unwavering Norse heritage, Highland Park brings you Thor. This stunning 16 year old single malt is believed to be the first whisky ever designed specifically around an individual’s character. With a natural strength like its namesake, drawing influence from the environment unique to Orkney, Thor is a truly elemental spirit. Distilled where sea turns to ocean, it represents a meeting point of nature’s forces, exuding a dynamic and bold character on the surface, but with an unexpected softer side at its heart. Thor represents the first coming for Highland Park’s stunning Valhalla Collection; a range of four unique whiskies, released annually, taking inspiration from the legendary Nordic gods of old. Not for the faint hearted, only those brave enough to accept the challenge of Thor shall be rewarded with the ultimate experience; a whisky of divine power. The Valhalla Collection is about more than great whisky, it gives an insight to the very being of the brand, its inspiration and raison d’etre. Thor will be available from specialist independent whisky retailers, at the Highland Park distillery and www.highlandpark.co.uk at a RRP of £120.